Sonke Gender Justice Network (2011). 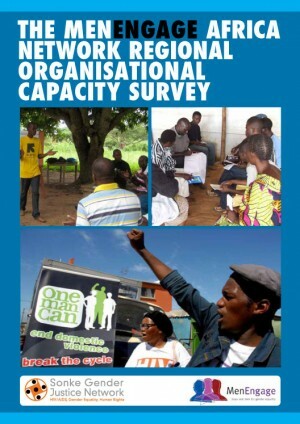 The MenEngage Africa Network Regional Organisational Capacity Survey. Sonke Gender Justice Network on behalf of MenEngage Africa Network: Cape Town, South Africa. The MenEngage Africa Network Regional Organisational Capacity Audit, conducted in October and November 2010, assessed the existing capacity, focus areas and challenges facing organisations in the gender justice sector in the African region. Findings from the capacity audit serve to inform future interventions to build the capacity of the MenEngage Africa Network to promote work with men and boys for gender equality in the continent. The survey contained questions in the following categories: (1) organisational demographics; (2) organisational strengths and weaknesses; (3) training provided by and needed by organisations; (4) knowledge of laws and policies pertaining to gender equality more broadly, and specific to working with men and boys; (5) interest in working with parliamentarians to promote work with men and boys on gender equality, and (6) assistance organisations need or could provide to members of the MenEngage Africa Network. Based on the findings of the audit (as outlined in this report) and building on respondents’ willingness to support the MenEngage Africa Network, the MenEngage Africa Network plans to: (1) provide training in areas of weakness; (2) develop programmes and strategies that build on its strengths; and (3) design initiatives to meet identified needs, such as addressing gaps in policy and engaging with parliamentarians. These activities will build the capacity of individual country networks and the MenEngage Africa Network, and will add to the momentum for increased engagement of men and boys for gender equality.